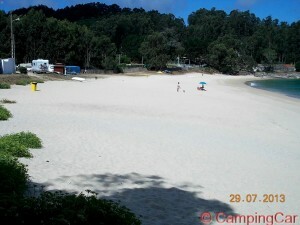 A wonderful Beach with withe Sand (little, little Stones). One Bar and one Kiosk. Shower (running out of Season) on the Beach and a public Toilet (open in the Season). Parking near the Beach – you have to go down by feet, to reach it. Police was one Day here (2017), but they said nothing. Guardian Civil was also one day here (2017) – also they said nothing. In Cangas, Beue and Moaña you find all Shops you need. 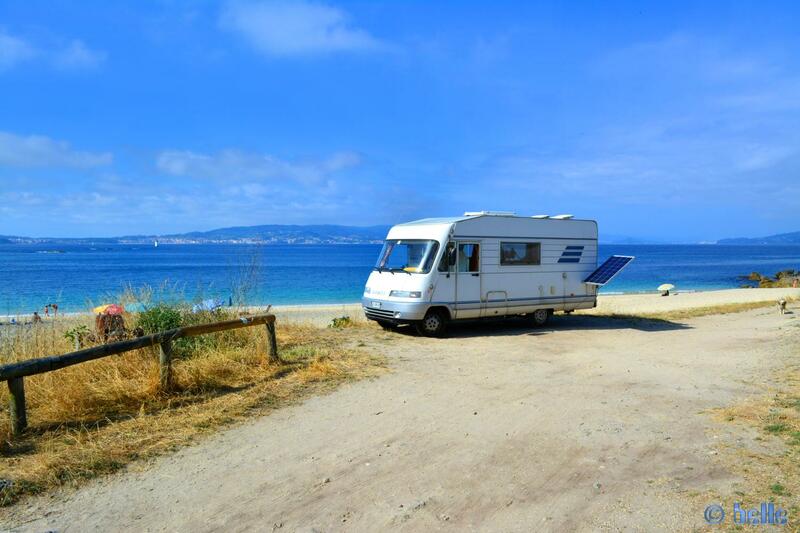 Dieser Beitrag wurde in Countries, Free Camping - Wild Camping, Fresh Water, GPS, Spain, Travel-Facts, Used Water, WC-Cassette veröffentlicht und mit 36937 Bueu, 94, Area Sosta Camper in Cangas, Atlantic-Coast, Atlantik-Küste, Bar, Beach, Beach with Sand, Bueu, Cabo de Udra, Cabo de Udra - Playa de Mourisca - Cabo Udra, Cabo de Udra – Spain / Spanien / Spagna / España, CampingCar, Cangas, Coast, España, fine and bright Sand, Free-Camping, Freistehen mit dem Wohnmobil, Fresh Water, Galicia, GPS, Kiosk, Küste, Marín, Meer, Motorhome, Parking, Parking at Cabo de Udra - Playa de Mourisca - Cabo Udra, Parking at Playa de Mourisca - Cabo Udra, Parking near Praia de Ancoradouro - EP-1302, Parking on the Beach, PO, Pontevedra, Praia da Mourisca, Public Toilet, Reise, Reisen, Reisen im Wohnmobil, Reisen im Womo, Reisen in Spanien, Reisen in Spanien mit dem Wohnmobil, Reisen mit dem CampingCar, Reisen mit dem Wohnmobil, Reisen mit dem WoMo, Reisen mit dem WoMo in Spanien, Sandstrand, Shower, Spagna, Spain, Spanien, Spanien - May 2017, Travel, Travel in Spain, Travel with a Camping Car, Travel with a CampingCar, Travel with the Camping Car in Spain, Travel with the CampingCar, Travel with the CampingCar in Spain, Travel with the Motorhome, Travel with the MotorHome in Spain, Unser Camper, Used Water, WC-Cassette, Wild-Camping, Wohnmobil, Womo getaggt. *jubel* - ein Sonnentag! ...ein bisschen unheimlich! 35 A1 in Richtung Athina am Marktplatz an der Kirche Castell de Sant Jordi d'Alfama - Spain Castle de Dénia der Himmel ist grau in grau Drohne Gefundenes Fressen! Möwen am Puerto de Punta Umbría - Spain Grummeln im Bauch Hefeklöße Instagram-Account kleine Wellen Leiria Limoncello ist alle! Lösung heute noch! Sant Carles de la Rapita Schaufensterbummel Schweißausbrüchen seit 12 Tagen rauchfrei! 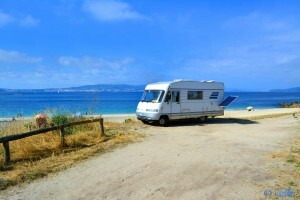 seit 1436 Tagen Leben im Camper Tanz durch die Lüfte Was ist hinter der Kurve? On the Road in Greece wer weiss was noch alles vom Himmel kommt!